A photo taken in 1962 captures supersonic shock waves as they pass over a scale model of the American X-15 hypersonic plane. Building a useful plane that's faster than Mach 5, or five times the speed of sound, is a difficult engineering challenge, but a team of researchers from the Chinese Academy of Sciences has a plan to pull it off. The trick to making these faster-than-Mach 5, or hypersonic, vehicles is to build a "waverider"-shaped airframe and top it off with a "high-pressure capture wing," the researchers wrote in a December 2017 letter to the journal Science China. Waveriders are aircraft bodies shaped to skim along the top of the pressure wave created by their own supersonic flight — in essence, using the shock wave to increase the plane's lift, or the upward force that keeps a plane in flight. But the roofs of waveriders can also become "compression surfaces" — planes that surrounding air flows against, pushing the whole vehicle back toward the ground. High-pressure capture wings (HCWs) attached to the top of the plane turn that pressure instead into additional lift. This design solves the basic problem of hypersonic planes, the researchers wrote: It's very difficult to build a Mach 5-plus plane with enough room inside for passengers or cargo that it doesn't knock itself out of the air. For a plane to stay aloft, it generates lift — which generally occurs when air flowing over the top of a plane is traveling faster than the air underneath it. Meanwhile, the faster a plane goes, the greater the force of the friction of surrounding air, or drag, is. For a plane to fly at very high speeds, however, that drag has to be much lower than that lift, or else the plane will struggle to move fast enough to stay airborne. Supersonic planes struggle with the additional problem of pressure waves created when they pass the speed of sound, which create additional drag on the airframe. The waverider-HCW combination is all about turning the pressure waves of hypersonic travel from drag and downward force into additional lift. Past designs that relied on the waverider airframe alone, like the Boeing X-51, had to be very slim — far too small for human passengers or meaningful cargo. But if you raise the roof on a hypersonic waverider, the researchers wrote, the airflow over the top of the vehicle will create drag and actually push it downward, reducing lift. Well-designed aerodynamic planes, they wrote, create lots of lift, have high lift-to-drag ratios and pack lots of cargo space compared to their total size. Sticking the HCW on top of a waverider lets designers give the vehicles higher roofs and more cargo space, and creates additional lift to keep the vehicle aloft at extreme speeds. 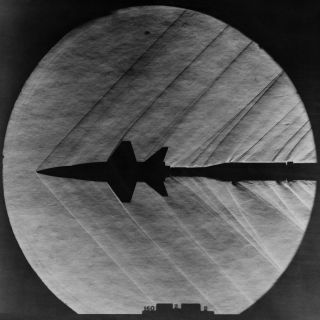 Hypersonic planes aren't entirely new. The Air Force X-15, flown throughout the 1960s, hit peak speeds of 4,520 mph (7,274 km/h), or Mach 6.7, with human pilots. And spacecraft routinely hit extreme speeds during re-entry; the space shuttle used to hit the atmosphere at nearly Mach 25. But the X-15 design, which wasn't a waverider, wasn't practical. And spacecraft only bust into hypersonic speeds during re-entry due to the massive momentum of orbit. And those machines aren't particularly useful for the reasons governments typically choose to build hypersonic vehicles: skirting air defenses and smashing into things hard enough to cause massive damage. U.S. Air Force Chief Scientist Geoffrey Zacharias told the National Interest in August 2017 that the U.S. "anticipates having hypersonic weapons by the 2020s, hypersonic drones by the 2030s and recoverable hypersonic drone aircraft by the 2040s. There is little doubt that hypersonic technology, whether it be weaponry or propulsion, or both, will figure prominently into future aircraft designs." This design could move the world a bit closer to that reality.